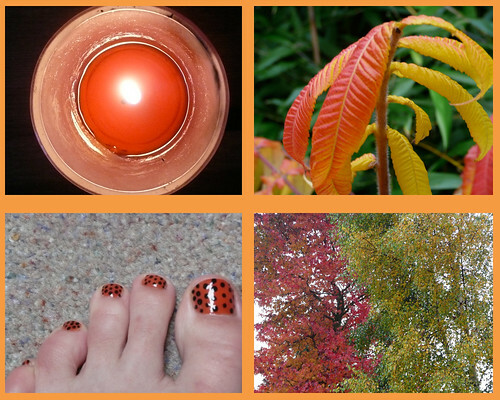 I thought I would put together some pictures I took today while thinking about the seasons. 1. Obviously today is Halloween, so the first picture is of my candy corn scented Yankee Candle. I love candy corn, which we don't have in this country (but my awesome American friend is sending me some, she really is amazing!!) so I had to make do with the scent for now. I had to get the little candle because they didn't have any larger ones at the garden centre, typical for this country unfortunately. 2. I spotted this plant randomly while I had wandered outside into the back garden to take a picture of the trees in picture 4, everything around it was still a lush green and there was just this fiery plant in the middle of the bed, it looked really quite striking. 3. You wont see this often, because I hate feet, especially my own, but these are my toenails at the moment, rather seasonal yes? 4. The red tree is actually in next door's garden, while the half yellow half green is in ours, it was screaming at me from my window and got me out of the house for a short while to take some snaps. I didn't manage to capture how bright the red is from so far away (it's a bloody tall tree) plus the clouds, and the wind making it hard to get it in focus, but trust me that it really is very bright red and truly hard to miss!